Variflight-Live on Time IOS app provides its users with accurate real-time flight status info... Created by Feeyo Technology Co. Ltd.
Variflight-Live on Time IOS app provides its users with real-time flight status info, incl. current location on the map, scheduled and actual time of departure and arrival. Users can look up airport tables and airport weather along with aircraft type and age used in a specific flight. The main feature of this app is information accuracy. Downloading the app as well as any functions and features inside the app is free. · Real-time flight status and market-leading flight predictions. · Global flight dynamics - any flight, anytime, anywhere. · Global airport flight board shows real-time arrivals/departures dynamics. · Can be searched through dates, departures, arrivals, airports, carriers and flight numbers. flight path, aircraft models and a lot more. 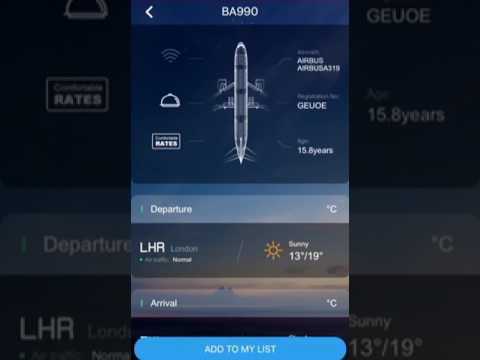 VariFlight-Live on time was added by DariaSolar in Jul 2017 and the latest update was made in Sep 2018. The list of alternatives was updated Sep 2018 There is a history of all activites on VariFlight-Live on time in our Activity Log. It's possible to update the information on VariFlight-Live on time or report it as discontinued, duplicated or spam. FlightStats is a free real-time flight status and airport tracking application for mobile devices. Alternatives to VariFlight-Live on time for Web, iPhone, Android, Windows, Mac and more. Filter by license to discover only free or Open Source alternatives. This list contains a total of 6 apps similar to VariFlight-Live on time. No reviews yet for VariFlight-Live on time, want to be first? Maybe you want to be the first to submit a comment about VariFlight-Live on time? Just click the button up to your right!